“Naxi is a Tibeto-Burman (TB) language, related to the Moso (a.k.a. W. Naxi) and Loloish (Yi) languages. Matisoff places Naxi in the Burmo-Naxi-Lolo group of TB within Sino-Tibetan. It is named after the Naxi ethnic minority group of China.” The Naxi are located primarily in the Lijiang municipality in China’s Southwestern Yunnan province. What follows is either translated or borrowed from Naxi scholars Fang Guoyu 方国瑜 and Li Jingsheng 李静生, with a bit of my own stuff added in. Naxi pictographs are pictures that have developed to become writing. In the native Naxi language, they are known as sər33 tɕə21 lʏ33 tɕə21. Tɕə21 means ‘record’, sər33 means ‘wood’, and lʏ33 means ‘stone’. Fang take the word to mean ‘draw a tree for a tree and draw a stone for a stone’, whereas Rock interprets it as ‘records made on wood and stone’. It is a writing system created by pictographic representation. Yu Qingyuan 余庆远 referred to this form of writing in his A record of things seen and heard in Weixi 《维西闻见录》 (1770), wherein he writes: “The Mosuo have a form of writing that is solely pictographic. For a person, they draw a person, for an object, they draw the object, and that is their script.” [Mosuo is the old Han-given name for the Naxi, 'Naxi' is their name in their own language]. Zhou Youguang’s “Character classification in the Naxi script”《纳西文字中的“六书”》was the first article to perform a relatively comprehensive quantitative analysis of the Dongba script. According to Zhou’s statistics: “Fang Guoyu’s “Dictionary of Naxi Pictographs” records a total of 2274 (100%) individual and compound ‘Dongba characters’ , 1,340 (58%) of which can be called ‘fundamental characters’ . In close relation to the fundamental characters are 685 (30%) ‘variant-form characters’, and there are a further 250 (11%) ‘derivative characters’. The statistics illustrate that ‘Dongba characters’ are developed ‘picto-semantic characters’. Based on Xu Shen’s ‘six categories’ of Chinese characters (六书), the Dongba script has 1076 (47%) pictographic characters, 761 （33%） ideogrammic compounds (including simple ideograms), and 437 (19%) picto-phonetic characters (including loan characters). 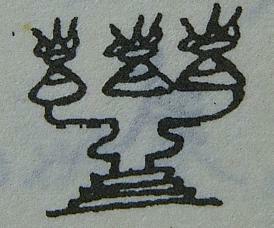 A common characteristic of a picto semantic script is a principal reliance on pictographs. Developed ideogrammic compounds indicate frequency of use. Picto-phonetic characters make up 19% of the characters in the Dongba script, very close to the 20% of the oracle bone script (1300 BCE) that is comprised of picto-phonetic characters.” Although Zhou’s work is extremely valuable, it is unfortunate that he regards the majority of compound and variant characters in the “Dictionary of Naxi Pictographs” as individual characters, meaning that the total number of characters in his calculations is much greater than the actual number. Therefore it is problematic for his ‘six categories’ ratios to reflect the real situation of the Dongba script. There is another Naxi script, phonetic in nature, that is known as gə33 ba21, the Geba script. Fang Guoyu notes that ‘ba21‘ means ‘call out’, and ‘ge33‘ means ‘onset’, and as a whole the word can be taken to mean ‘pronounce the word by looking at characters’. The script is composed of characters formed from simple strokes, with set pronunciations. Whilst J.F. Rock believed the Geba scrip to predate the pictographic, the consensus of Chinese research is that the pictographic script is earlier. Very few scriptures are written in Geba, and it’s multitiude of geographical variants mean it is of very little practical use. The pictographs originated in the distant past, from the use of pictures to record events; and by the time they began acting as linguistic markers, using one image to represent one thing, with one meaning and a set pronunciation, they became writing. This kind of writing can only develop under certain social conditions – likely after the formation of a ‘class society’. The creation and use of Naxi pictographs are closely related to the Dongba religion. Cliffs in the Baidi region of Lijiang that preserve mature examples of Naxi pictographs are said to have originated in the time of the Dongba ‘Sa Le’ 萨勒, and can be dated to the mid 11th century. It is therefore believable to suggest that by the 11th century AD Naxi pictographs were being used to write scriptures. Naxi pictographs are used in the Dongba religion, and as such some collectively call them the ‘Dongba script’. Writing is born from social practice, and serves practical social needs. Although Naxi pictographs are related to the Dongba religion, it is probable that the writing existed before it was used for religious purposes. By the time of the Dongba Sa Le, Naxi pictographs were already in wide usage, and as such we should not call them the ‘Dongba script’, but instead the ‘Naxi script’.